All species of squash and pumpkin are native to South and Central America. Squash became popular in New England especially because it provided an excellent food source well into the winter. The difference between the winter and summer squashes are that summer squash has a very soft skin and the winter squash has a tough, hard skin. Winter squashes created themselves in different sizes, shapes and colors, yet all maintain the same basic characteristics in taste and nutrition. Winter squash is superior in nutritional value to summer squash, but there are substantial differences among winter squash cultivars. Butternut is the highest in vitamin A, carbohydrate, iron, sodium and potassium, which increase substantially with seed maturity. Hubbard is also superior in nutritive value to many other winter squash cultivars. 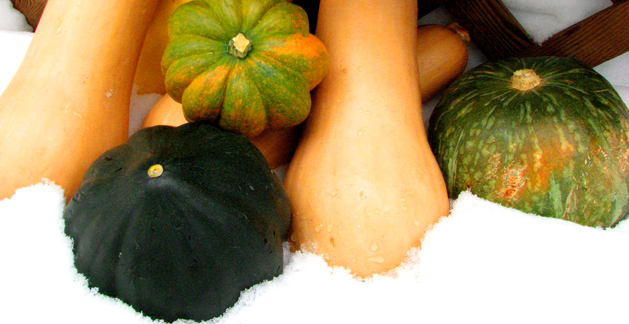 All winter squash can be prepared in the same fashion. The one way in which all winter squashes can be prepared is by cutting them in half and putting them cut-side down in a baking pan, baked at 375F until soft for about one hour. The seeds can be taken out before or after cooking. Some winter squashes, like Hubbard, big butternut and of course the small sugar pie pumpkins make excellent pie fillings for traditional pumpkin pies. Squash can be eaten plain or with filling. Keep them out of the refrigerator! Stored in a cool(50-60F), dry place. Most winter squash will keep for a couple of months.